A linear encoder from HEIDENHAIN is essential for machines that require high quality positioning accuracy, reliability and machining speed. Their advanced design improves productivity by eliminating machine tool position errors caused by thermal expansion of recirculating ball screws in linear feed axes, reversal errors, errors caused by deformation of the drive mechanics by machining forces and kinematic problems through pitch error in the recirculating ball screw. HEIDENHAIN's linear encoders are used in a wide variety of industries from milling machines to electronics and semiconductors. The direct drive technology of linear motors offers low wear, low maintenance and higher productivity. Compact, lightweight and easy to install, linear encoders from HEIDENHAIN function properly even after many years of operation. 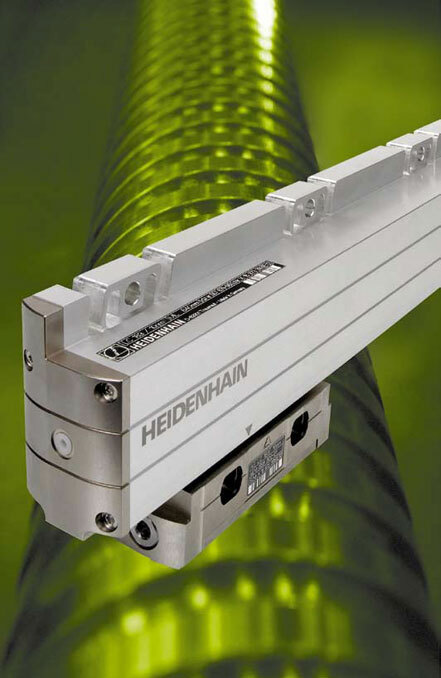 In addition to increased accuracy, high long-term speed stability and thermal behaviour control, HEIDENHAIN's linear encoders also reduce machine frame vibration, stop excessive noise exposure and are highly tolerant to contamination. Length gauges from HEIDENHAIN offer high accuracy over long measuring ranges. The same gauge, for example, can measure parts from 5 mm to 100 mm. Sturdy HEIDENHAIN gauges have many industrial applications from automatic inspection equipment and manual measuring stations to positioning equipment. You can depend on HEIDENHAIN gauges wherever lengths, spacing, thickness, height or linear motion need to be measured quickly, reliably and accurately. NEW LC xx5 series now available!